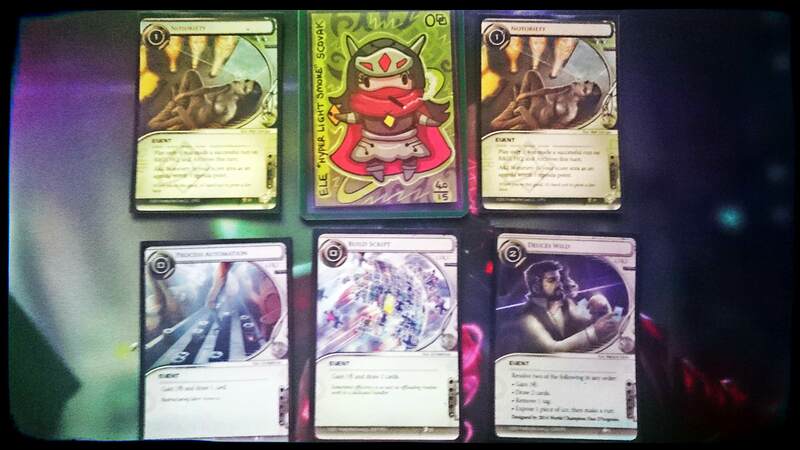 This is an Android: Netrunner related article. Specifically a report about my journey to Ghent, Belgium for the Belgian National Championship of 2017 on the 12th of November. I know I did not end up writing a report for the Greek Nationals of 2017 since I uploaded the Vlog but that was mostly because I was busy. I might make some time in the next couple of days to make a quick write-up for what happened in Greece as well. There will also be a vlog (shorter this time) coming out soon for the Belgian Nationals trip though. Alex (DrunkAlex) messaged me a couple months ago saying “hey dude, wanna carpool to the Belgian Nationals together?” and so it all begun. Couple messages to my pal David (Cpt_Nice) and we were already three people who had decided to roll over to Ghent, Belgium to participate in the Belgian Netrunner Nationals of 2017. With a decent placement at Euros (top 32) and three times a top cut in three 2017 National events thus far (Spain, Netherlands, Greece) I kinda felt like going to Belgium was a little bit too much. Nonetheless though, I knew that a lot of awesome Netrunner players I know were going too, so I figured I might as well go, play my favorite game and make some jokes with people I rarely ever see because they live four to five hours away from me. I did end up in the Top 8 cut again (and actually 4th place overall) so I am quite happy with how it went in the end of the day, but more of that chatter in the end of the report. 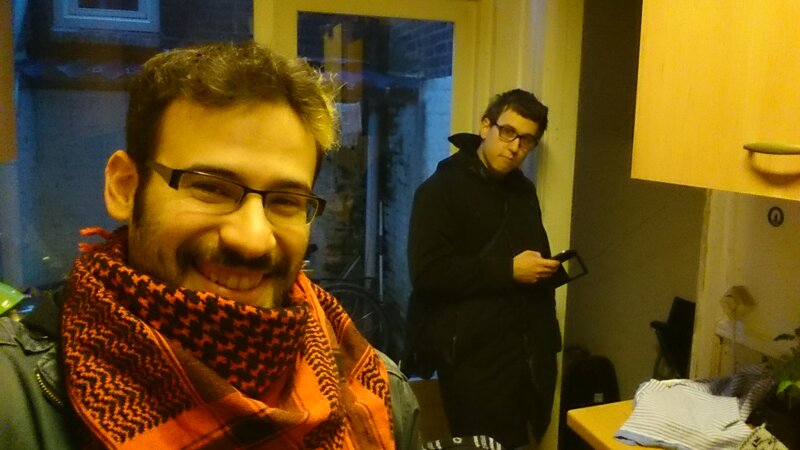 David came over to my place in the Hague to sleep over and practice tons of Netrunner before Alex comes to pick us up the next day in his super vintage Volkswagen beetle to drive all the way to Ghent. 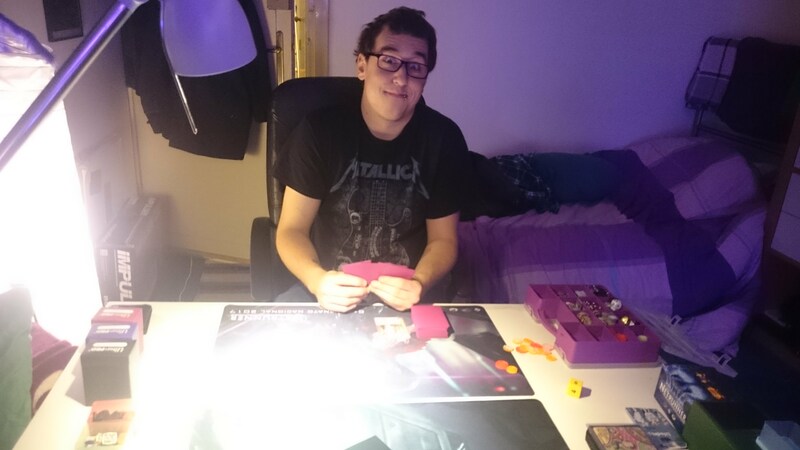 Alex also visited me the afternoon of the day before the event for practice so I basically spent around 8 to 9 hours playing Netrunner on Saturday too. I was quite convinced I would be taking my Smoke deck again, which I have mostly practiced with since rotation happened even though I never really had the chance to actually try it out in a big tournament. I have developed a “thing” for stealth and 40 card stack Runners so Smoke has been my runner of choice for quite a while now ever since I dropped out of Silhouette. I will tell you though that I have been experimenting quite a bit with Silhouette builds lately, but Criminals do need some new good cards in order to actually make them competitive again through all the other IDs that cannot do Geist shenanigans. The deck goes EXTREMELY fast and I find it so satisfying to play. I basically spent 9 influence on x3 Deuces Wild, x3 Build Script and x3 Process Automation. With the addition of x3 Diesel, in a 40 card deck full of cheap things to install, you just go through it and set up really fast, which is what Smoke wants in order to start pressuring centrals and threaten remote access too. Only expensive things in it are Paperclip (which I hate that it costs 4 credits, but alas, it is the only decent long-term barrier breaker right now), Net Mercur and Dagger. I removed x1 Build Script to include x1 Hunting Grounds which was a last minute decision and ended up only helping me against two match-ups. If I did not have it, the outcome would have still been the same basically. I mostly included it for Komainus and early Data Raven but I only ever saw Data Ravens. The thing is though that it would have helped against the net damage match-ups a lot. A big value card in the deck was Trope. There was not a single game (except the one where I got stomped by CI on camera for having been too greedy in the first turn) where Trope did not fire for less than 7 counters and in many of the games, it actually gave me the win. Shuffling back all the money/draw cards is so huge. I basically shuffle back Maker’s Eye, Process Automation, Sure Gamble and any other money/draw cards I have, unless I am of course missing a really important resource (like trashed Film Critics) and just go again. I have my whole setup by that point, so you basically just build up steam in one turn and go again for another two turns. Many people asked me how I manage with only 5 MU when I have x6 important programs. What I would do was always just play Cloak, use it and then trash it if I wanted to put Equivocation down. I basically just get it back with Trope later if I really need it back but that was rarely the case since Net Mercur was pretty loaded by that point. Another HUGE value card was Notoriety. If you have been following my deckbuilding choices in the past couple of years, you’ll know that in all of my decks thus far, I have included at least x1 Notoriety, which has ended up giving me a LOT of good standings. That card has become somewhat my signature thing and I am so in love with it. I even said that when I looked at the Core 2.0 announcement, I was just happy to see that and Ronin in the list and I knew Netrunner would keep being amazing for me just because of that. For the last two tournaments though, I decided that x1 Notoriety was too little for my Smoke deck, so I went all in and included x2 of it. Beth allows for double Notoriety plays so I figured “might as well.” This has been by far one of the best choices I have made with the deck, since the deck goes SO fast that you end up setting up so nicely, you can actually fire a Notoriety mid-game or have plenty of steam to go and do the double one in the end-game. I am very happy to say that I double Notorietied for the win twice in the Belgian Nationals and I did it a 3rd time on camera just for the giggles and going out of it in style in my final game. I do not currently know if I would change anything in the deck, but I definitely need to try it in more tournaments before I decide if it needs changes or not. The CI match-up could definitely be better. The x2 Citadel Sanctuary is actually there because I expected Brain Rewiring CI decks but I ended up not facing any of those. However, the Sanctuary did help me deal with removing tags faster and easier against CtM and actually helped a lot with winning that match-up. Oh, Brahman did not do anything and I had just included it in the deck instead of Atman. I really do not like having cards that do nothing though, so it might become a Freedom Through Equality or something else funky. On the corp side though, having seen how Worlds went down, I was pretty darn sure everyone would be on Hayley, packing a feedback filter or a Caldera if they were running anything else, just to counter all those pesky potato decks (Potential Unleashed). I was completely right and I am therefore very glad I did not bring my Poisonous Herbs Garden (Palana Foods) deck, as I am not sure how well that list would have done. I would have had a couple good match-ups, but overall, the deck I ended up bringing did way better. I had prepared a Nisei Division deck with a bunch of Old Hollywood and Red Herrings in it that run x2 of various agendas (without The Future Perfect though) but in testing, I realized that even though the deck made a lot of money and was decently fast, it felt a bit iffy. Alex then made a comment at some point during Saturday’s practice games, saying “you play so many code gates, why don’t you do your Gated Garden thing again?” And so I did. I prepared this deck just 2 hours before doing a couple practice games against David the day before the event. I built a new version of the Gated Garden, marking it first as “The Return of Gated Garden” but later deciding on “The Arcane Garden” since I kinda like to give every deck that gets a good standing a distinct name. You know, Encrypted Portals, my secret love for the arcane in wizardry and voila; weird hipstery deck name done. 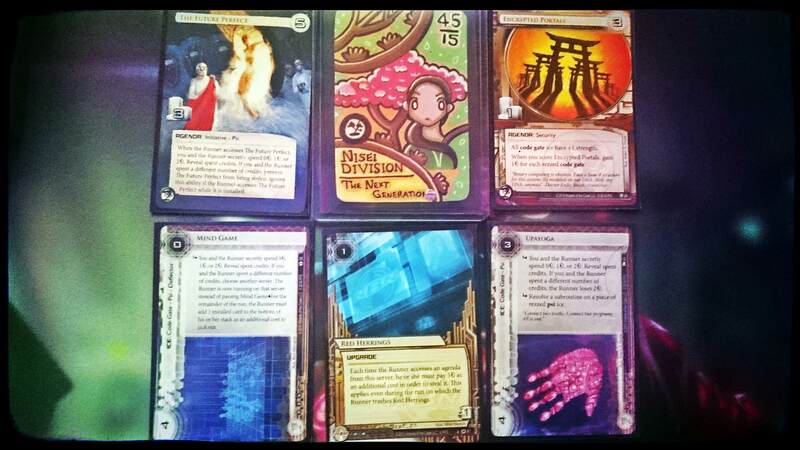 Some real Netrunner talk though. Since I was not going to do kill, I figured I need to do some kind of glacier I know how to play well. Nisei Division was the obvious choice, since 1. I know how to play it to its maximum potential, 2. I know people don’t know how to play against PSI ICE and make lots of mistakes when it comes to breaking it or letting it fire and 3. it’s good from early to late game because of the cheap but very taxing ICE. The fact that I beat two Hayleys with Gordian Blades already answers the question “is it taxing enough for the current Shaper decks?” I only had a few issues with a Smoke but you can read the round description of that match-up and see how I beat it. If I were to change something, that would definitely be the agenda suite. I figured that when I faced Film Critic, it was too easy for them to come in and steal stuff. Red Herrings and The Future Perfect are both dead if my opponent plays Film Critic. I would add x3 Braintrust and x1 Philotic Entanglement instead (since the deck is at 21 agenda points at the moment, that is doable by removing x9 and adding x8 points). The reason behind this is also because it is easy to just install something in the remote and fake it as an upgrade and actually end up being an agenda. I scored most of my Encrypted Portals that way actually and that really boosted my game in every single case. My only concern would be not being able to drag out the game through winning The Future Perfect psi games, but that is a risk I will have to test in future versions. How fast or slow it can go. Another thing I would definitely change would be DNA Tracker and Miraju. I know Miraju is a great card, especially against Indexing, but when I play a certain card in my deck and end up not using it at all, I just figure it is not my sort of playstyle kind of card so I just remove it for something I would play more. I can understand why it would be great for others, but I never really used it myself (maybe once). DNA Tracker was too expensive and although it is amazing when it is boosted to strength 8, I never really needed it, since all the other ICE was already high enough strength to annoy the runner, so no reason to be losing 8 credits to just one piece of ICE when you can rez 10 other pieces with that money. This also allows you to have more money to use on Ash’s trace. The deck did what it was supposed to do. A lot of baiting to the remote with just upgrades. Great upgrade play on centrals to tax out the runner (even with just x1 or x2 pieces of ICE, they paid x5 to x6 credits every time), constant recursion of upgrades through Preemptive and surprise Cricks at high strength and lots of psi game shenanigans. I had two games where the runner ran somewhere, faced stuff he couldn’t break and then ended up getting redirected somewhere by Mind Game, then back again by Upayoga, then back again by Mind game, then back again by Upayoga, etc. etc. which ended up basically making me 4-5 credits just from one click the runner had taken to run on a server, while at the same time leaving him with x5 to x6 credits less in his pool. Both of my opponents in those cases just freaked out and just asked me “does this ever end?” but they realized there was a way to end it by just putting installed cards at the bottom of their stack (Mind Game’s effect). Vanilla and Cobra are there for the gear check of course and they are also both really nice targets for early-game Batty. Crisium was MVP, doubling up on the tax for people that wanted to do Indexing runs. x1 Shipment of Tennin allowed me to score an Encrypted out of hand against non-Clot runners and also allowed me to fake out a 3/5 agenda as a 2/4 for the win. Scarcity of Resources taxed out half of the runners I played against and it also allowed me to keep Employee Strike off the board because that card destroys all of my ICE (if I cannot gain credits out of the ID then I am pretty much done for). Macrophage at strength 8 or 9 always fires. x1 scored Encrypted Portals makes Black Orchestra pay 6 credits to break 7 of your Code Gates. x2 scored Encrypted makes it pay 6 to break 12 of your ICE. I definitely believe Nisei Division is still alive after yesterday’s tournament and I am also definitely going to continue refining it from here on again. So, after a long car drive we arrived at the Belgian Nationals, hugged a bunch of people we hadn’t seen in a while, wrote our decklists and waited for the tournament to start. Next page will be an explanation of how the rounds went! A bit of a rules flub though, according to the FAQ firing Mind Game through another ICE (ie Upayoga) doesn’t do the redirect since it specifies “instead of passing Mind Game”. Something to keep in mind for the future! This is huge, thanks a TON for this note because this changes a lot of things.